If you're a car nut and you buy this game, forget about getting any work done. You might as well start looking up marriage counselors in the phone book, too. And this isn't even the full game! Gran Turismo 5 Prologue is a teaser for Gran Turismo 5, which I daresay will be out once they've sold enough copies of Prologue to ensure enough GT addicts will be clamoring for their fix to ensure its profitability. I've been playing the game for about two weeks now and it took as much will power to drag myself back to the word processor as it did to quit smoking cigarettes. Maybe more. Available for the Playstation 3 on Blu-ray disc and via download (must be a heckuva download! 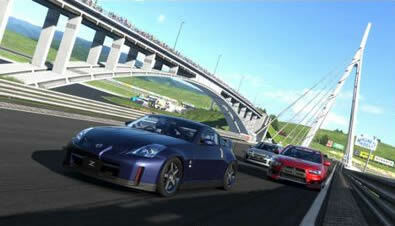 ), GT 5 Prologue is more of a racing simulator than mere video game. It gives you a selection of some 60 cars from which to choose – though perhaps "choose" is the wrong word; you have to start small and, by earning credits through your racing prowess, advance steadily to niftier, more powerful, and more exotic vehicles. The dealerships you can visit (and ogle at their wares if you can't afford the sticker price yet) run the gamut from the little Suzuki Swift (Sport Tuned, of course!) to the mighty Ferrari F40, with a drool-inducing selection between, including (in no particular order) Nissan's new GT-R supercar, the Lexus IS-F, Audi R8, Chevy Corvette, BMW M3, Lotus Elise, Mazda RX-8, and Ford GT. There's enough iron to keep you happy until the full game arrives. As much as I was devastated by not being allowed to head right for the Acura NSX I've lusted after for years, starting instead with a car modest in horsepower, speed and capabilities, it pays to "walk" before you start running with the big boys: you learn to drive. Each car feels different and takes varying amounts of skill. I love the Nissan GT-R for its horsepower and four wheel drive stability, for example, though I struggle with the mighty Dodge Viper – a real "hairy chested man's car" that (at least in my hands) seems born to spin at the least excess pressure on the gas or brake. You can customize your ride's color and a few other parameters (traction control, active steering, etc.) before you hit the track, and you can choose which perspective you have, from a camera that seems mounted at the car's front bumper, to one that follows you from above and – my favorite – the view from the driver's seat, complete with gauges that operate in real time and your virtual hands on the steering wheel. The only thing missing from that view is the ability to use your virtual hands to make virtual gestures at other drivers, which would come in really, really handy during the game's online component. There are only six tracks, but they're a nice cross section, from street circuit (Chinatown and Piccadilly in London, England), to road courses (two in Japan, the gorgeously alpine Eiger Nordwand and a "High Speed Ring" the name of which is self explanatory) and Daytona's 2.5 mile banked tri-oval speedway. Each track has its own charm and challenges. The easiest is Daytona, which only has long left turns, but it's also the fastest by far and that brings its own challenges. Daytona's a good place to haul out your highest horsepower brute, damn the torpedoes and put the spurs to 'er. The best place to learn is the High Speed Ring, which gives you a long straightaway, sweeping curves and hard braking tight corners. 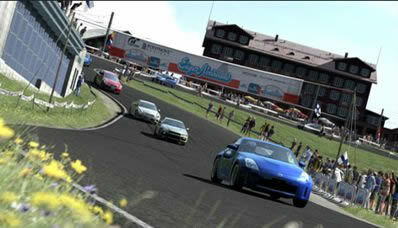 The tighter road courses are the most challenging. Fortunately (or, depending on your bent, unfortunately) GT 5's programmers don't let you run off the track and mow down spectators, which would be particularly deadly on the Eiger Nordwand circuit. The game is rendered beautifully. The cars are gorgeous (and, fortunately, don't show any of the damage I've inflicted on them repeatedly) and the tracks and their background environments are crafted with loving detail. The producers have exploited Blu-ray's 1080p capability well. The picture is bright, clean and colorful, with detail that, while not completely photorealistic, is close enough. The realism extends to the lighting; exit the tunnel on the high speed ring, for example, and your eyes are dazzled for an instant as the bright sunlight streams back into your cockpit. Then there's the sound. If your system supports it, you can choose Dolby Digital 5.1 or Linear PCM in 5.1 or 7.1 channel configuration. I'm running it in 5.1 LPCM and it's spectacular. Not only do the engines' songs sound scrumptious, but the wind roars around you as you push through tortured air, curbs thump from front to back as you use (or abuse) them and when you pass another car – or get passed – the sound of the other vehicle goes by you just as it should. There are many events you must master to earn credits, and some are really tough! For instance, one event sees you in last place (16th) on the High Speed Ring, in a specified vehicle, and you have to make it to the podium in a single lap to clear it! There's an arcade setting for those times you just want to practice, or play, and if you choose to go racing in the online world you can partake of various adventures in which you're going head to head with total strangers from all over the place. Those people are nuts! 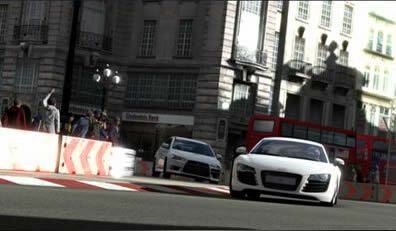 If they drive in the real world like they do in this virtual one, it explains some of the carnage on today's highways. Many's the time I've been working my way to the front of the pack, only to have some idiot slam into me from behind and send my car spinning crazily. Adding insult to injury, I've been spun off the track only to have the game assess me a four second penalty (the racing equivalent of the kiss of death) for taking a short cut! This is where the lack of "virtual gesturing capability" really hurts. Fortunately, the computerized drivers in the offline events have more driving decorum. 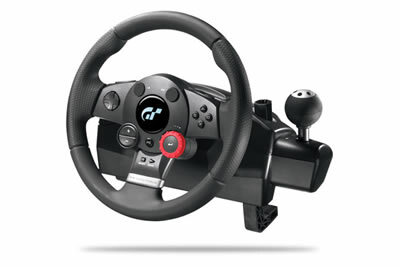 GT 5 Prologue works well with the PS3 controllers, but if you're serious about driving, you'll want a real racing wheel such as Logitech's Driving Force GT, "The Official Wheel of Gran Turismo." Logitech was kind enough to send me one and it's the missing link that makes GT 5 more simulator than game. 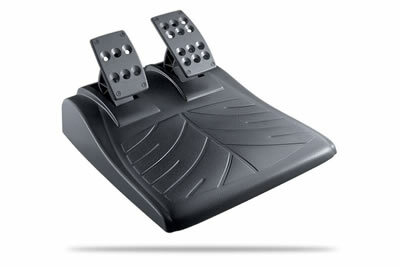 The $150 unit comes in two pieces: the wheel itself and the gas/brake pedal module, and it hooks into the PS3 via USB. The wheel features "force feedback" technology, which lets you feel those bumps and curbs when you run over them – and those walls when you hit them, and ensures the wheel requires effort to steer. The effort depends on the car, simulating its particular oversteer, understeer or, when some online oaf whacks into you, lack of steer. Its rubber rim is comfortable in the hands and feels solid enough to last (as it should!) and the wheel unit clamps onto a table (or whatever). The buttons duplicate those of the regular game pad's, with extras such as a 24-position real time adjustment dial that lets you fine-tune your brake bias, traction control and other stuff on the fly. There's also a sequential stick shift and rear-mounted buttons you can use as paddle shifters. The pedals are definitely the icing on the cake; the base even has a spiky thing to keep it from sliding across the carpet as you race. A hundred and fifty bucks may seem like a lot for a game controller, but using a game pad with a driving game or simulator just doesn't cut it. If you're serious about virtual driving, you owe it to yourself to get a wheel like this Logitech. As if all this weren't enough, GT 5 Prologue also includes Gran Turismo TV, an online channel that delivers motorsport programming and manufacturer information. The Blu-ray disc also comes with a high definition behind-the-scenes video called "Beyond the Apex" as well as other videos that can be downloaded as they become available, such as a series of features on Nissan's GT-R. The game, er, simulator can also update itself online, as has already happened since I installed it. 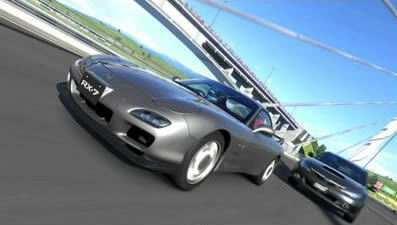 Sony hasn't announced when the full Gran Turismo 5 will be released, but they have said you'll be able to bring your Prologue progress with you, which will be handy.